It allows you to convert DWF (Design Web Format) files to AutoCAD DWG and DXF file formats, so you can recover DWF entities to corresponding DWG entities easily. Convert DWF to DWG and DXF. Supports the DWF multi-page specification. Restores the layers in DWF, renders entire DWF pages. Extracts embedded Images from the DWF file. Batch conversion ability allows you to convert an unlimited number of DWF files at a time. It is a standalone program, AutoCAD not required. With the free trial of the program, you may test it free of charge for 15-times. If you want to continue to use it after the trial period, you must register the program. The registration fee for Any DWF to DWG Converter as low as US $118. The registration fee includes lifetime technical support and lifetime free future upgrades. Click the "Add DWF Files" button to add the DWF files. You can also drag the DWF files from Explorer and drop them into the program window. Choose the output file type, file version and output folder. 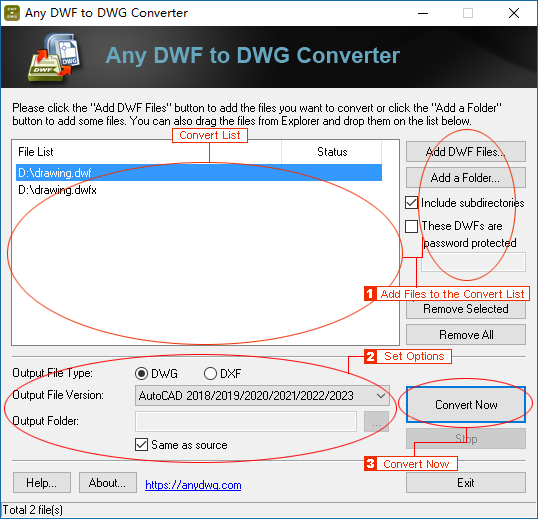 Click the "Convert Now" button to convert the DWF files to DWG/DXF.